Product Description: YES! It's finally here! 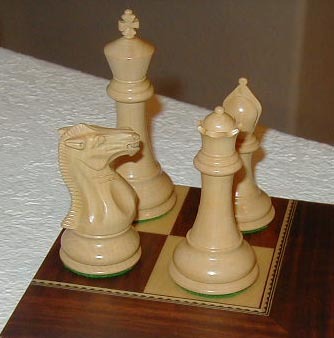 The Special Edition Staunton Style 4" Chess Pieces with their own fitted box. This is absolutely the most stunning chess set we have gotten our hands on. Made out of solid Boxwood and Rosewood, it is sure to match your chess table perfectly. You will not find this chess set cheaper anywhere else. Shop around and come back! The set with box weights over 10 Lb. Product Weight and Measurements: Set Weights about 10 pounds. Comments:This Set is only available in Rosewood and Boxwood. These sets match perfect with any of our tables! Shipped via UPS or inside the table's packaging if bought together. Supplies are limited!